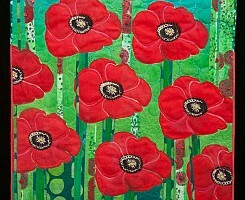 Reception and Artist Talk: Sunday, June 9, from 2-5 p.m.
Catherine Worthington of Brunswick creates colorful textile paintings with themes of nature, flowers, pears and poppies. Her landscapes celebrate her surroundings by depicting the Maine woods, the sea, pine trees or street scenes using bold bright colors. Catherine creates her own fabrics by painting or silkscreening, and often finishes the work with French knots, beads, and other embroidery techniques. Come visit our gallery and enjoy this burst of sunshine while taking in some innovative textile techniques and beautiful pieces. 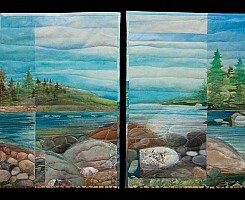 About the Artist: Catherine Worthington is a textile artist living with her husband and three boys in Brunswick, Maine. She has a BFA in textile design from University of MA, N.Dartmouth. Catherine spends time working in her home studio designing and creating textiles. 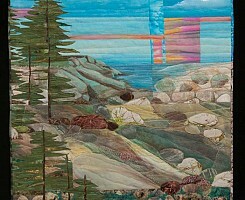 Her art quilts are part of many private collections and have been exhibited throughout Maine, New England, Florida, in Galleries, Art walks and shows. Catherine continues to works part time as an artist mentor at Spindleworks in Brunswick, Maine. She has served on the board of Arts are Elementary, planning committee of the Brunswick 10x10 show and has collaborated as an artist in residence in the Brunswick elementary schools. 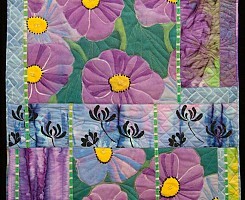 She also teaches surface design classes and workshops in the midcoast community. 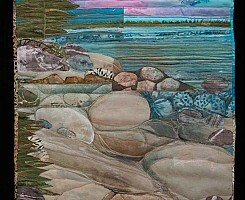 Catherine is a member of Five Rivers Arts Alliance, Maine FiberArts, Maine Crafts Association, Designing Women and Surface Design Association. 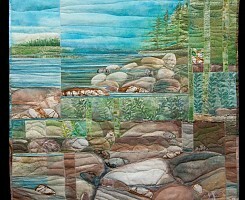 Artist Statement: "My work presents images of the natural environment from the gardens to the sea. Color, texture, pattern and design are constant sources of inspiration to me. I love to be in the moment, creating. 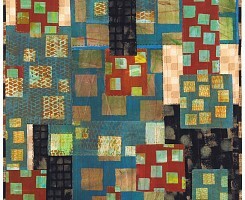 My textile works are constructed by layering surfaces and techniques. 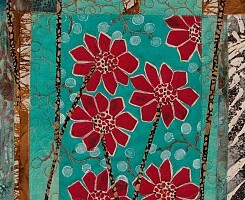 Painting, printing and hand stitching accentuate detail and increase texture and depth. I like to create a rich surface which will draw the viewer in and hold their attention as they look further into the work creating a feeling or familiar place to escape." A workshop of "Textile Painting & Surface Design Techniques" for clothing makers and quilters with Catherine was held on June 22, from 10 a.m.-2 p.m.